While the United States is fully preoccupied with global crises ranging from the fight against ISIS in Iraq and Syria, the spread of Ebola and the conflict in Ukraine, there is another development on the world stage which threatens the economic health of every single American and American based business. Specifically, I am referencing the Trans Pacific Partnership. 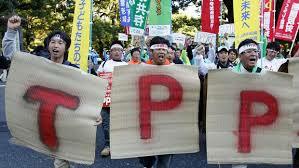 The protocols of the TPP establishes a free-trade zone/bloc stretching from Vietnam to Chile and Japan. The most draconian free trade agreement in history includes nearly a billion people which encompass almost 40% of the world’s economy. Since Obama failed to fast-track the TPP into law last year, he has made amazing progress and America is nearing its fate with destiny. Some of you are reading these words have no idea what the Trans-Pacific Partnership consists of. Most of you have never heard of it. Some of you have heard or read the term, but fail to realize the extreme danger that the implementation of this so-called trade agreement will mean to America and our way of life. 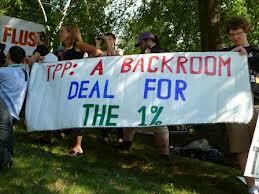 A scant few are coming to realize just how dangerous the TPP truly is. 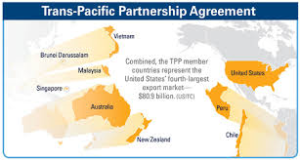 For the record, the TPP is masquerading as a free trade agreement involving the US, Australia, Japan, Canada,Brunei, Vietnam, Malaysia, Chile, Mexico, New Zealand, Peru and Singapore. The TPP is much, much more than a free trade agreement. Under the TPP, GMO labels for US food would not be allowed. Also not allowed is Congressional oversight. When something is secret and kept from you, it is usually very bad for you! As if it is not egregious enough that Congress is not allowed to view TPP documents, the 600 corporate officials, who form the TPP panel (e.g. corporate officials from corporations such as Monsanto and Walmart, have complete control of the developmental process of the TPP. 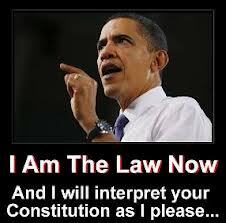 Obama can view any part of the process, Congress and the American public cannot. This is Agenda 21 on steroids and it is being fully implemented through the backdoor. That is why the TPP is being kept from Congress and the American people. These facts lead me to state that this President needs to be arrested and tried for treason. Even the Chinese get it, while the Americans comfortably sit on the couch while their nation is being carved up piece by piece. Obama’s fast tracking of the TPP is designed to be completed by the end of the year which would coincide with the commencement of many of Obama’s health care reforms which are in the process of being implemented (e.g. the tripling Obamacare fines and the full exposure of the “death panels” which deny many kinds of heathcare treatments at age 70 and above). I wish I could accurately state that the loss of sovereignty is the only threat that the TPP poses to the American people. However, to say so, would constitute a grossly inaccurate statement. Under the TPP, the alternative media will be destroyed, guns will be confiscated and the face of American employment will be forever changed in ways that you will not believe. 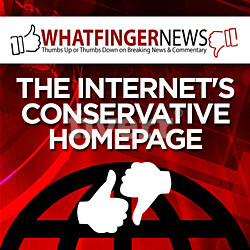 If anything, this article has understated the threat posed to America by the TPP. The TPP is not a free trade agreement, it is a document which introduces a new era into American government. If the TPP passes, we will be living in an absolute corporate dictatorship. This constitutes a form of economic martial law. And while this article is passing out one nightmare after another, please consider the fact that China and Russia are being purposely left out of the TPP. From an economic standpoint, that makes no sense unless one realizes that we are on a collision course with World War III and the BRIC nations, headed by China and Russia who will be our opponent in the upcoming conflict. In his recent trip to Asia, Obama said the TPP, is in a deadlock largely due to disagreement between the United States and Japan over how widely Japan will open its doors to farm exports, had the potential to be an “historic achievement”. JAPANESE FARMERS ARE THE ONLY OBSTACLE REMAINING THAT WHEN RESOLVED, WILL RESULT IN THE ESTABLISHMENT OF A TOTAL CORPORATE CONTROLLED POLICE STATE DICTATORSHIP OVER THE UNITED STATES.